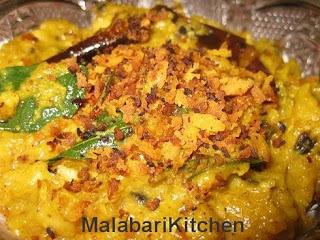 Erisseri is a kerala dish and it is also a part of feast, be it onam ,vishu or marriage .Here I have used yellow pumpkin but it can be made with papaya also. =►Soak black-eyed beans for 1hr and Cut the pumpkin into small cubes. While the above ingredients are being cooked do steps 3&4. =►Heat 2tps of oil in a pan, add cumin seeds and allow it to splutter. 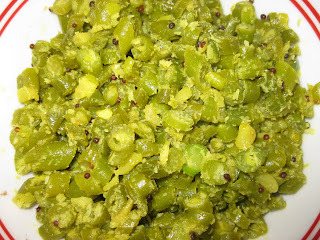 =►Add grated coconut, turmeric, chilly powder, green chilies and garlic podes. =►Fry it until coconut turns brown and grind it (make a fine paste). =►By this time water would have evaporated from the boiling pumpkin. And add grinded paste into it. =►Mix it properly and let it stay in a sim flame for 4-6min. =► Heat 2tsp of oil in a pan, add mustard seeds and allow it to splutter. 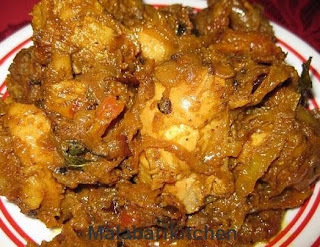 =► Add dried chilies, curry leaves and 2tsp of grated coconut and fry it. =►.Pour these fried mixture into the cooked pumpkin & black-eyed beans and mix well. =►Serve hot it with plane rice.